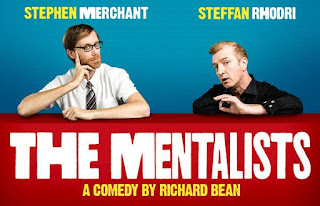 This revival of Richard Bean's 2002 play sees Stephen Merchant as Ted in his stage debut alongside Steffan Rhodri as Morrie. The two odd characters are long time friends on an excursion to a dingy hotel room in order to shoot a life changing film. The first act is peppered with amusing anecdotes and well delivered comedy by this unlikely pair. Merchant is well cast as the awkward, down and out salesman looking for a better way of life. As the hotel phone keeps ringing, he has increasing moments of anger demonstrated with bold physicality. Rhodri's performance is natural and he breathes life into Morrie, the camp hairdresser with a story for every situation and a propensity for making dirty films. There is a glimmer of hope for something meaningful as Ted reveals he has discovered a new, better way of life as he plans to set up a community which anyone can join for a mere £29.99. However, as the play moves into its second act, the script becomes heavy handed and bizarre. While Ted had been played as mildly manic in the first act, it quickly becomes evident that the audience is supposed to believe he is far more unhinged than that. In my view there was not enough build up this, though this is partly the fault of a script which swiftly descends into farce. The origin of Ted and Morrie's friendship is revealed in a twist which is disappointingly predictable and I was left wondering what the point of the play was. There are moments of humour in The Mentalists, and Stephen Merchant can add successful stage acting to his extensive CV. However, the talented cast are prevented from delivering meaningful performances by a script which just doesn't cut it in my view. Many thanks to Theatreblogger.co.uk for arranging a press ticket to this show. For more details on this production visit the website.